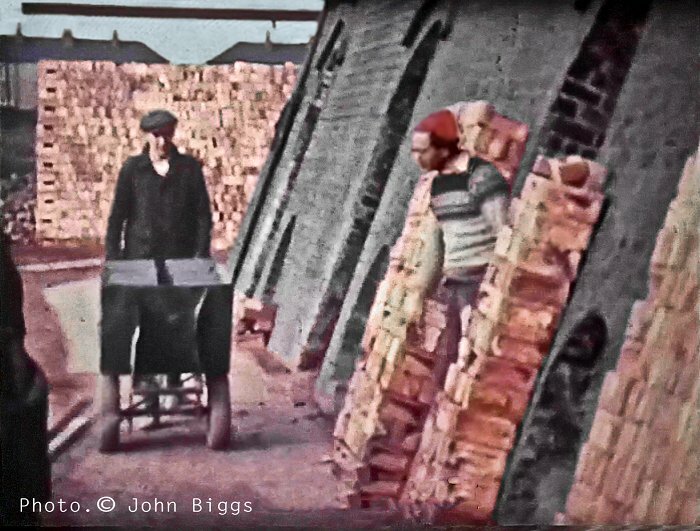 "Old Bricks- History at your feet"
John Biggs writes: This photograph of Hickleton Brickworks was taken about 50 years ago on a summers evening. 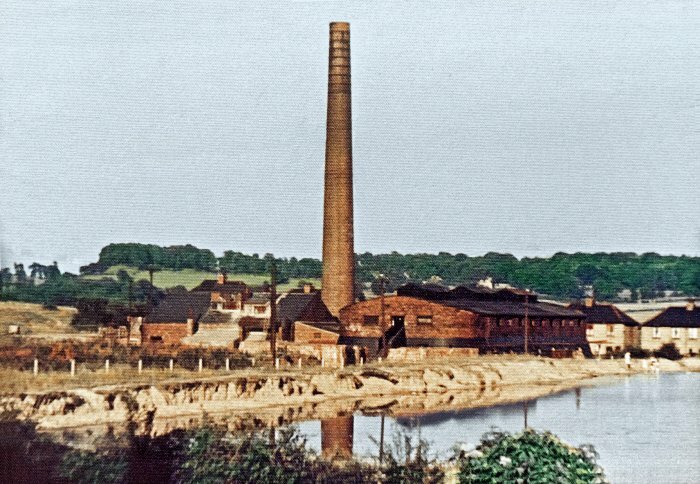 Hickleton Brickworks was not in Hickleton but on the outskirts in Thurnscoe. Hickleton village was near the woods in the background. This brick was made at the Hickleton Colliery in South Yorkshire. 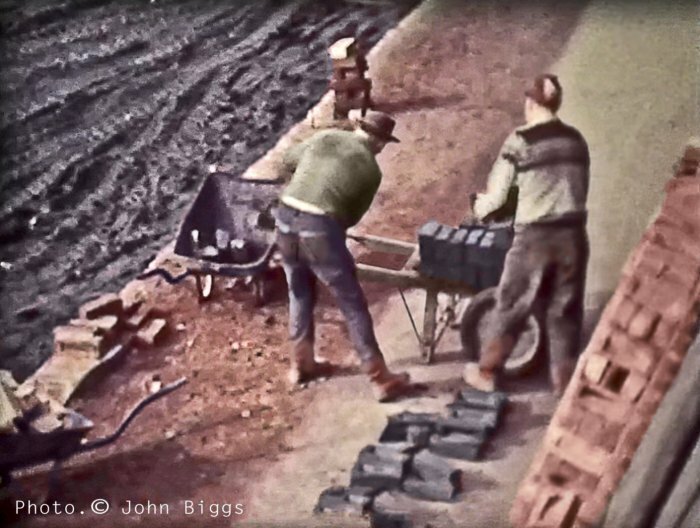 John Biggs writes: The shallow dished frog is old, my grandfather worked at Hickleton as a brick burner. I can remember him talking about it, when he worked at Hickleton he said that there was also a Newcastle kiln at the side of the Hoffman. I may be among the few left that worked in an old brickworks under conditions that would not be allowed today. 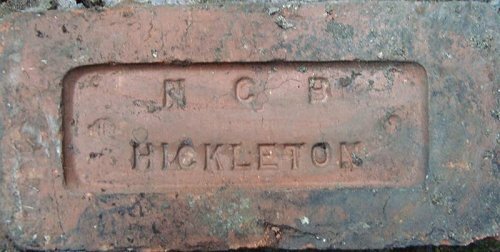 The second brick N.C.B HICKLETON is another old design, I cannot remember seeing these at all. I started work there in the 1950's when I left school, at that time and up to the brickworks closing in the 60s, the frog in the brick just said HICKLETON. 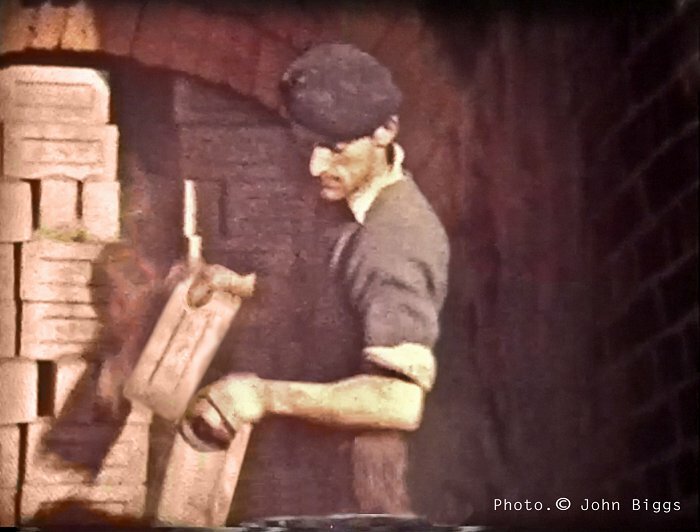 The brickmaking machinery was Bradley and Craven, a double press and the kiln was a Hoffman continuous. Although the quality is not wonderful, these views are a reminder of how hard life was in the industry in the not too distant past. This is one of the drawers working in a wicket hole. In the background of this picture there is a stack of bricks, as you can see one brick is laying on its back. This was done at one end of the row, on the other end of the row were three stretchers, this offset each row and tied the bricks in. This is one of the drawers going down a ramp into the bottom field. The drawers would move 18,to 20,000 bricks a day. Two men would stack the bricks, the stacks were made up of what we called blades. Each blade had 1000 bricks in them 50 along 20 high. To start a stack you would have to build two blades together, these would be tied together at 5, 10, and 15 high. 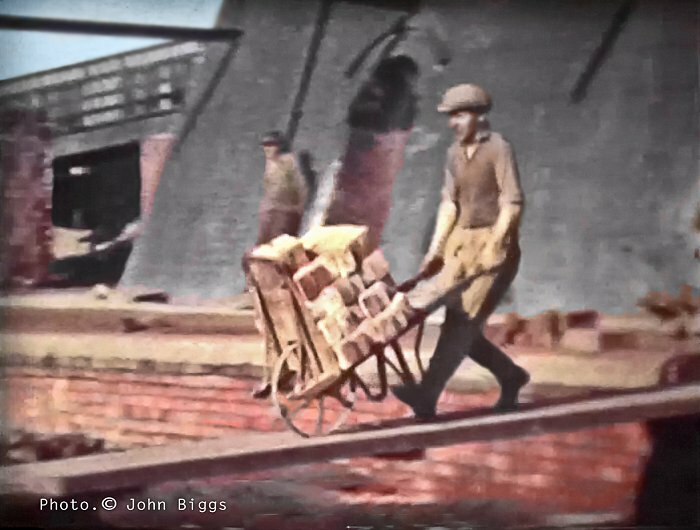 Filling a lorry for one of the collieries,. the drawers would tip their barrows and one lad would keep throwing them towards the front of the lorry. This time for a change the drawer is on the lorry and the lad is drawing. 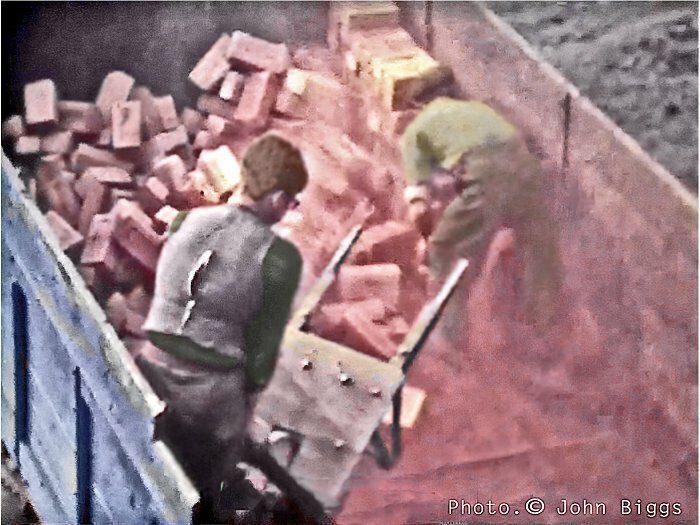 A barrow of green bricks being tipped. What happened here is that the wheeler had the shafts too high, or hit a brick. The lad in the red cap helping to clean up was the kiln cleaner that day. 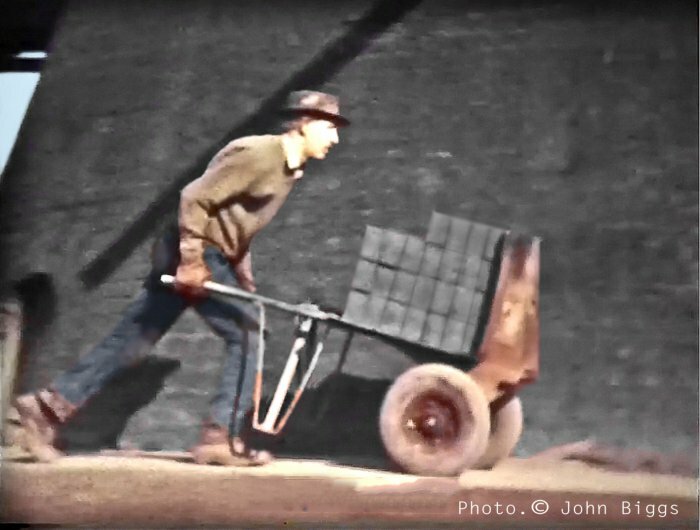 This lad is wheeling green bricks to the setters, these wheelbarrows came from a brickyard that had closed. When I was wheeling the wheelbarrows were made of wood with one iron wheel, these had to run on steel plates. The wheeler would move 18 to 20,000 bricks a day.